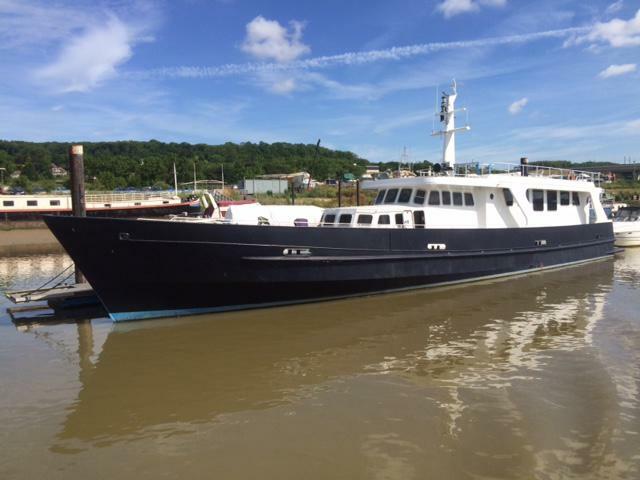 Premier Houseboats are pleased to present The Flying Dutchman, originally a German naval customs patrol vessel, converted to a spacious and luxurious cruising home. This is a rare opportunity to purchase such a classic but stylish cruising home, it's size means that unlike a barge you do not forsake accommodation space for an engine room. Walking in to The Flying Dutchman you are immediately struck by the quality of the finish. The main living area is stunning, offering light and space, and great attention to detail. This area has a good sized saloon area, dining area, and a bar/galley area. There are various levels of lighting, and excellent quality flooring. A stairway by the entrance leads down to the captains quarters, an amazing area with fitted double bed and lots of fitted storage, together with various levels of lighting. there is a large bathroom, with toilet, hand basin and a luxurious Jacuzzi bath. From the galley a doorway leads through to the wheelhouse area, a good size offering panoramic views, and well equipped including Koden MD3641 radar, Navman and depth sounder. From this room a short corridor leads to a second lounge/office area, again well fitted in the style of the main accommodation, and also light and comfortable. Stairs from the corridor lead down to the crews quarters. this is a self contained facility that has a galley area with hob, sink and storage. There is a separate shower room with shower, toilet and hand basin. There is also a spacious saloon area, that can also sleep up to six, with one double and four single berths. The engine room has full headroom throughout, and houses the two powerful MTU engines, generator and bowthruster. MTU were taken over by Rolls Royce in 2014. The boat is fully centrally heated by a Kabola heating system, and also has air conditioning throughout. The Flying Dutchman offers excellent outdoor space on two levels including an upper deck that runs half the length of the boat, so enjoying your surroundings wherever you find yourself is a pleasure. The Flying Dutchman is an absolutely stunning example of its kind, and whether you choose to cruise her, or use her as a static home, she offers an amazing, life changing opportunity. Vessel name: The Flying Dutchman Vessel condition: Good Year constructed: 1957 Berths: 8 Cabins: 2 Heads: 2 No. of engines: 2 Engine model: MTU 12v 396TC 61 Engine power: 2600 Fuel type: Diesel Drive type: Shaft drive Length over all: 95' 5" Beam: 19' 7" Maximum draft: 4' 9" Hull material: Steel Hull type: Other Keel type: Other Fuel capacity: 9092 Litres Water capacity: 2273 Litres Holding tank capacity: 200 Litres Disclaimer Premier Houseboats offers the details of this advert in good faith as it was presented by the seller or his representative but cannot guarantee or warrant the accuracy of this information nor warrant the condition of the described item within this advert. A buyer should instruct his agents, or his surveyors, to investigate such details as the buyer desires validated. The Item described within this advert is offered subject to prior sale, price change, or withdrawal without notice.